I have in the past written about the value of a long-log fire in the context of articles detailing the building of a lean-to shelter and later, the renovation of a previously used shelter. This has prompted readers to ask questions about the long-log fire itself, how it should be built, how it should be established. When I worked with Lars Fält he used to say there was an old saying that, “logs as thick as a capercaillie will keep you warm all night”. I don’t know the source of the old adage. Knowing Lars’s sense of humour, I half suspect he may have made it up himself. But that doesn’t really matter. I can attest to the fact that this adage, however old or new it is, relates the truth. The capercaillie is quite a big bird. This translates to chunky logs and the need to fell dead, standing trees. As I mentioned in Podcast Episode 6, the key tools you should carry in a winter forest environment are an axe and a snow shovel. 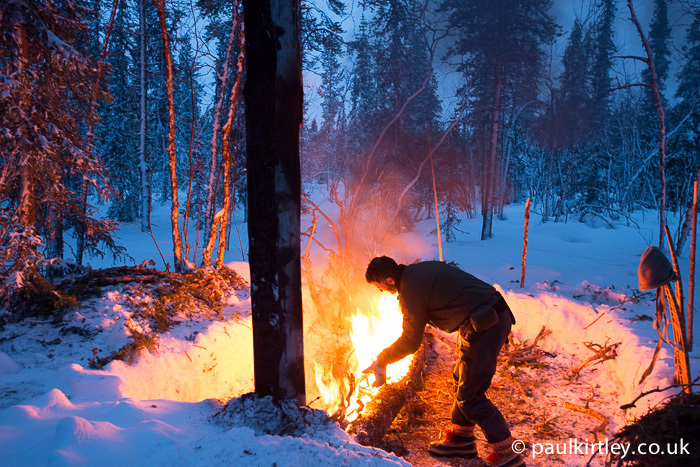 Both come into their own in preparing a long log fire – the axe for felling the fuel and the shovel for digging the pit in which the fire will sit. It’s not just the size of fuel you need to get right, it’s the condition. I’ll reiterate – it has to be dead and standing. It should be well seasoned and still be solid, not rotten. Well seasoned pine will burn very well. The best will have a concentration of resin that will make it both ignite and burn with ease. Recently, after lighting a telegraph pole thickness pine log with birch bark and wood chippings, a friend of mine expressed surprise it worked. He was right to be surprised of course. 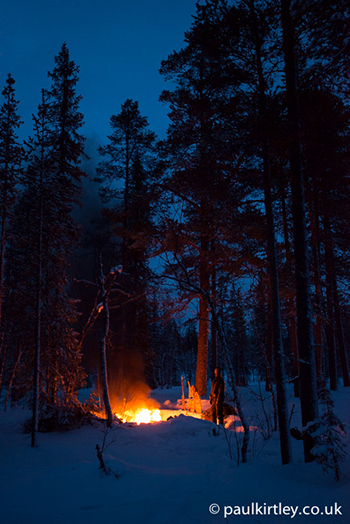 In most situations good firelighting emphasises starting with small fuel then working up through progressively larger fuel until you have a fire the size you want. In the case of a long-log fire this approach is still prudent, of course, particularly if you are in dire need of its warmth. With a lean-to shelter, your fire should be a step away from the shelter. You should create sufficient space for the logs in front of the shelter. In other situations, you should create a pit large enough for the fire and for moving around in the area, as well as perhaps a sleeping area directly in front of the fire. 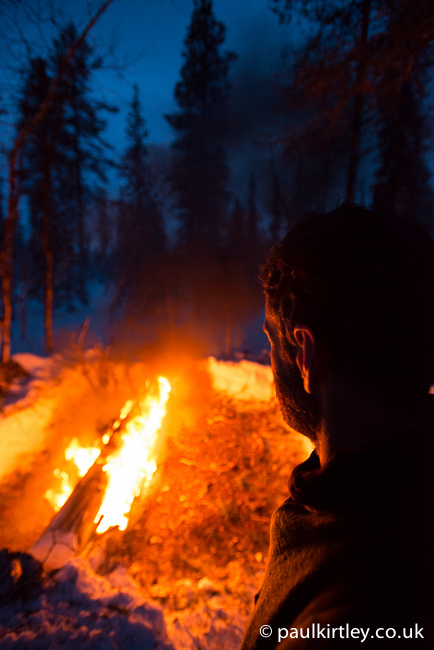 You do not want to be walking around in deep snow then steeping in front of a hot fire. You’ll just melt snow into your clothing and footwear. Better to have more room to move around without having to step into deep snow. Pre-planning always pays dividends. Any shelter should be built on a suitable site that is close to both raw materials for the shelter as well as fuel for the fire. With a long-log fire in particular, you want the site of the fire as close to the source fuel as possible. A 7-8ft (approx 2.5 metre) log, 12 inches (30 cm) in diameter is hard to move, especially on snow. You should take great care with protecting your back at all times. Hence, if you can fell a tree, section it and pretty much roll the logs straight into a pit you have dug right next to it, then all the better. The classic emergency long-log fire uses three logs. It burns more strongly than the two-log fire, which I discuss in Podcast 6. With the three-log fire, the largest diameter log goes on top. This is the log from the base of the tree. The other two logs form the base of the triangle. But the top log is not placed in direct contact with the two supporting logs. You need to create some space. You do this with some braces of green wood arranged in an X shape between the base logs. These are placed towards the ends of the base logs so there is an uninterrupted space in between the logs for most of their length. These green X-stays should be a couple of inches (5cm) in diameter. And I repeat, they should be of green wood as you do not want them to burn through too soon. I generally use birch, which holds a lot of water. Once you have your base logs and stays in place, your are ready to light the fire. This you do in the regular fashion, with small sticks (as described here) or with feathersticks. Build the fire up in between the two base logs. Once it is established, work to spread it laterally so that you have a longer fire in between the base logs. Some extra fuel will be needed for this. Plus it can be useful to have a long stick to use to rake and prod the fire into the shape you want. Remember, you will probably have a reasonable amount of smaller fuel from the branches of the tree you felled. Once you have a fire going pretty much along the length the the base logs, almost out to the X-stays at each end, then you can place the big log on top. When that is in place, it should take easily as long as a) you have chosen your main fuel well and b) the fire underneath is sufficiently well established. 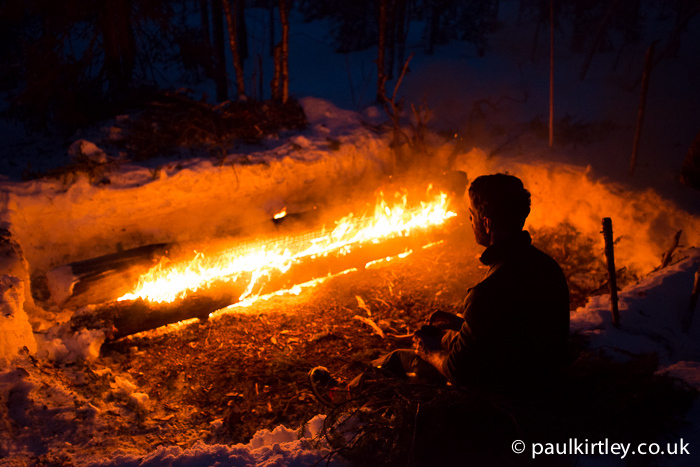 Benefiting from the warmth of the fire and melting snow for water. Photo: Paul Kirtley. As a final note – just in case it’s not obvious to all readers – this type of fire should be used sparingly and only where there are many dead standing trees available, as they form important habitats for insect life as well as feeding and nesting opportunities for some birds. 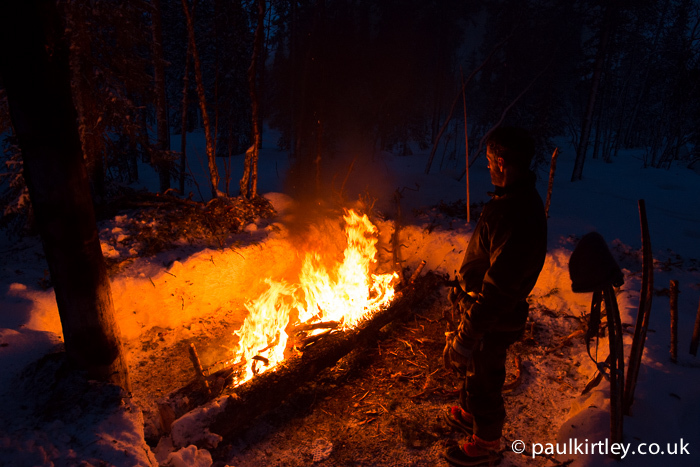 A long log fire burns a huge amount of fuel and gives off a lot of heat. Localised damage to forest floor soil and vegetation is unavoidable. It is certainly not something for regular use but it is valuable to have in your arsenal of cold weather techniques in case you should ever need it and I hope this article helps explain how such a fire can be established. Hi Paul. Excellent article as always. I think its great you actually put up photos as I always find seeing something done is much easier to understand than words. Words are open to interpretation. many thanks. I’m in the same boat as you. I find visuals a real help in understanding concepts and techniques too. I’m glad you found the photos useful in this article. Sound, real-world advice, as ever. A great series Paul, keep them coming. You are doing like the best of researchers, learning from experts, putting their advice to the test, then sharing the results. You are causing me to experiment with your techniques and compare them to the things I was taught. The long fire is a good point. I’ve always used a “point” fire, typically using 4″-6″ diameter 4′-8′ long standing dead logs in an “X” to burn the centers and keep pushing them into the fire. 4 or 5 logs like this will keep burning all night with some tending and a pile of smaller stuff to coax it along. I usually have a log stack reflector behind it too, which becomes tomorrow’s fuel. This system has its problems: Point heat, too many log ends hanging out around the fire, and too much tending, moving logs. Your “long fire” solves a lot of these, and can still use the log stack reflector. Incidentally, using a tarp, especially a reflective tarp inside your lean-to wall will reflect a lot of the fire’s infrared heat back onto you, as well as provide wind and water protection. I do like that your articles vary from minimalist (what to do if you have nothing) to provisioned camping with the tent and wood stove. Excellent stuff Paul. It’s good to hear from you. I’ve just had a look at the link through to the SAR winter camp. It looks as though lots was covered and by the smiling faces in the photos, the team found it enjoyable as well as useful. Point or star fires burn efficiently once established and will burn for a long while with larger fuel. But they do not give out a huge amount of heat (related point to their efficiency). Log stack reflectors do help efficiency a little but personally I find the main benefit in drying/pre-warming fire wood – less energy is required to light the logs when they are introduced to the fire and thus the fire is more efficient. When you get the chance, have a go at actually setting the reflector ablaze. I suspect you will be surprised by the results if you get the thing going well. It’s like a grill…. I agree with you about the effectiveness of a tarp inside a lean-to shelter in increasing its efficiency in terms of heat reflection, wind proofing and water proofing. It’s well worth the effort. Even a polythene sheet or survival bag can be put to this use. Thanks for your comments Steve. They are much appreciated. I agree a video would have been great but filming in such low light is problematic. Thanks for the informative article on the long fire. It may come necessary one day as you say. I so much appreciate all your articles…keep them coming and stay warm b y the fire. Thanks for your feedback Steve. Much appreciated. great article as usual; some winter I used a smaller version of the long log fire which is more suitable in my enviriments, but I liked to know the 3 logs version, just in case. Thanks for your comment. Yes a smaller version works well is less extreme conditions. 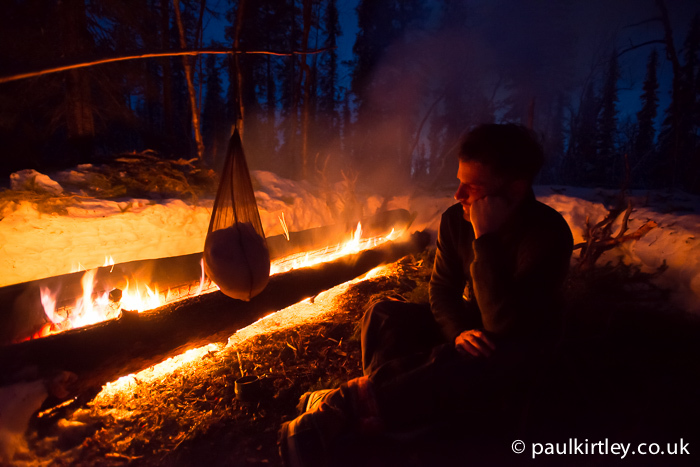 If I sleep in a one-man open fronted debris shelter, I create a long fire in front of me. It doesn’t need to be as big as the arctic version but is still very warming. Such an excellent and necessary topic to discuss. This knowledge would go completely extinct if it weren’t for blogs like this that taught the skill well, and encouraged adventurous souls to go to the woods and give it a go! Thanks for another great article Paul. I have done long log fires myself in the past, and often found that the top log rolled off or fell between the base logs. Of course, I never considered the X shaped supports, and using green wood is a simple stroke of genius. What an immaculately conceived and delivered web site- and such engaging content…videos, articles, audio- if it was a book I would be compulsively turning pages, glad to have stumbled across this- will take some time to work out my favourite bits. Thank you, thank you. Thank you Andy. Welcome. I’m glad you have stumbled in too. Enjoy the various aspects of this site and keep in touch. Really great article Paul, very much enjoyed along with the relative links. A fire most of us would want to try at some point in time. Thank you. My pleasure Tim. Glad you enjoyed this. Thanks for the feedback. Hi Paul thanks for this one . Could a long log fire be placed between two lean to shelters? Could this cause other problems? Yes, it could and that would be an efficient use of such a fire. You’d want to make sure that the fire was aligned with the prevailing wind so as not to blow smoke into either shelter. Good to re-read this as I’ve got another survival night coming up in January. Did one last week, but it was so warm I hardly needed the fire.